You’ve heard of Crowd sourcing right? Well “Life of Pies” is currently at the printers and when it comes back, the author of it (me!) will get hit with a large invoice for printing it. I’m not made of money at the best of times, let alone when I’ve just spent two years driving 10,000 miles and around five grand travelling the country eating 400 pies. Over 100 wonderful people took up the offer to have their name/inscription in the back in return for buying in advance. Now that the book has gone to print that offer has now closed. However, the crowd funding concept is still running. Every person who buys a book between now and October helps to fund the cost of printing it and also receives a copy hot off the press. Here’s your chance to own a limited edition copy of Life of Pies. 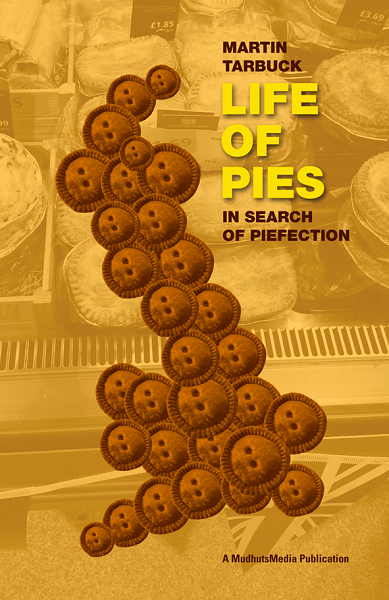 A humorous travelogue of one man’s search for the ultimate pie. People often do strange things upon approaching middle age. They try to solve unanswered questions or come over all obsessive about the most innocuous of activities. Some decide to run a marathon or climb Mount Kilimanjaro or learn to play the guitar. Me? I just wanted to find the perfect pie. We all love pies but who is going to be brave enough to take THAT challenge on. Perhaps the only way to find out is to get some lunatic to spend the best part of two years travelling the country to find out. From Inverurie to St Ives. Cornish Pasties to Steak and Gravy. I am that lunatic and this is my story. There have been books on pies written before but they’ve always been written by experts. The difference with this one is that it’s written by a COMPLETE IDIOT. Part culinary review, part travelogue Life of Pies is written with humour, attention to detail and often downright desperation, the story documents exactly what happens when someone takes their hobby just a little bit too seriously. With 400 pies sampled and exactly 314 reviewed, it also serves as a useful reference point as to where to find the best pastry products throughout the heartlands of the UK and gives a whistle stop tour of Britain’s finest pie purveyors. Warning: Life of Pies should not be read on an empty stomach. Please note: On some PCs, using Internet Explorer may prevent the item from being added to the cart. This is a problem with Internet Explorer itself. If possible, please use another browser or, if you can’t do that, CONTACT US to order.